Clyde and Seamore's Sea Lion High is a animal show in Shows at SeaWorld Orlando. While it's not the best, it is also recommended. 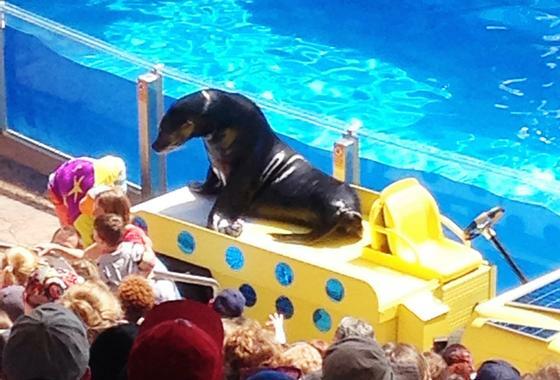 The latest version of SeaWorld's sea lion, walrus and otter show opened April 16, 2015. From the park's description: "It’s the last day of school at Sea Lion High and both Clyde – the school’s top math whiz – and Seamore – the school’s sports hero – are nominated to win scholarships to Sea Lion University. But Trip, who’s the school’s self-appointed varsity star and resident tough guy, has different plans. It turns out Clyde and Seamore haven’t completed all their classes and only have one day to finish them!"